A German teenager who had joined the ISIS terrorist group has explained how she managed to travel from Germany to Turkey and then to Syria and Iraq to fight for the terrorist group. There were a lot of stories about Linda Wenzel who was dragged from the rubble in Mosul as Iraqi forces liberated the city in July. She was 16 years old when she joined ISIS, and now for the first time in an interview with the Iraqi magazine Al-Qadha, which belongs to the country’s judiciary, she has recounted her story of joining ISIS. The magazine, in an interview titled ‘The German Angel of ISIS,’ published the details of Linda Wenzel’s trip from Germany to join ISIS. According to a Farsi report by Asr-e Iran, Linda, who appeared in an Iraqi court a few days ago, said that she first got acquainted with a Jordanian girl named Fatima. After becoming friend with Linda, Fatima invited her to Islam, and then she introduced Linda to a preacher called Abu Khaled, who was the Imam of a mosque in Pulsnitz, eastern Germany. This preacher told Linda that he could not visit her so much as he is a man and Linda is a girl and this is not allowed in Islam. But the preacher gave a few books about Islam in the German language to Linda as gift. Linda said later it became clear that the preacher did not want to meet her because he was under the control of German security police. During this period, Fatima invited Linda to Islamic forums and conferences held by the extremists in Germany. Linda is now 17 years old. Appearing in court with hijab she told the judge that she is deeply regretful and would like to return to her country. She further added that in these Islamists’ associations she got familiar with a man known as Abu Usama al-Shishani. Abu Usama convinced Linda to travel to the land of the Islamic Caliphate to marry him. Linda added that the change in her behaviour led her school authorities to send a message to her mother and inform her about the suspicious changes in the behaviour of her daughter. Linda’s mother beat her when she got aware of the changes in her behaviour. The mother’s behavior and changes in the girl’s behaviour spoiled their relationship; a relationship that was not very good from the very beginning. After Linda’s relationship with her family soured, she informed Abu Usama of the story. Abu Usama gave her instructions and urged Linda to travel to Turkey to marry him. As Linda was underage, she needed her mother’s consent to travel, so she forged her mother’s signature in the form and traveled to Turkey to meet with the groom, Abu Usama. When Linda arrived in Turkey, Abu Usama informed her that he had traveled to Syria for a special mission. Therefore, he read the sermon of the marriage (Khutba) on the phone and Linda formally became the wife of Abu Usama. Abu Usama, who was now Linda’s husband, ordered her to go to the border areas of Syria until his Chechen friends transfer her to Syria. Linda says after three hours of walking along the Turkish-Syrian border she finally met with Abu Usama. The ISIS’s bride said she met Abu Usama near a large house in Syria that she did not exactly know its location. She added that they stayed one day there, and then along with other married women and their children were transferred to Mosul. In Mosul, Linda first stayed in a large military camp for three months and then along with his husband, Abu Usama, was transferred to their private home in Mosul. She says she was alone in Mosul, and just once a day she was met by a woman from the ISIS’s administrative board who was responsible for distributing food. Linda confessed in the interview that she was just three months with Abu Usama and then she was told her husband had been killed. 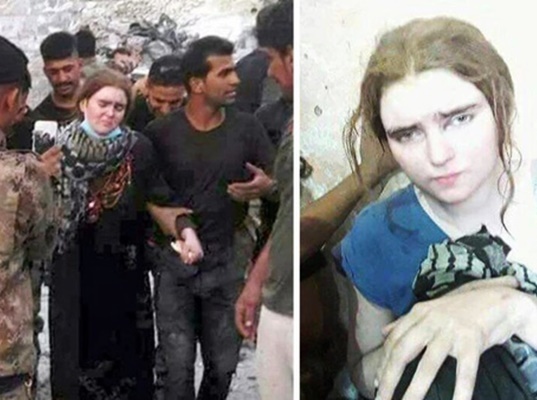 The German girl explained while the Iraqi forces were approaching Mosul, she decided to return to her home country after the death of Abu Usama, but the ISIS group prevented her and all those who were in Mosul from leaving the city. She said in this interview that ISIS gave her $200 to compensate for her husband’s death adding that after the siege of Mosul by Iraqi forces, ISIS holed up all the women in a hospital, but with the liberation of the city, she saw herself in the custody of the Iraqi anti-terror forces. Linda is now being tried in an Iraqi court.